Toronto, May 30, 2012---The McMurtry Gardens of Justice celebrated the dedication of three new sculptures and the 80th birthday of the Hon. R. Roy McMurtry, former Chief Justice of the Court of Appeal for Ontario and the province’s Attorney General from 1975 to 1985. 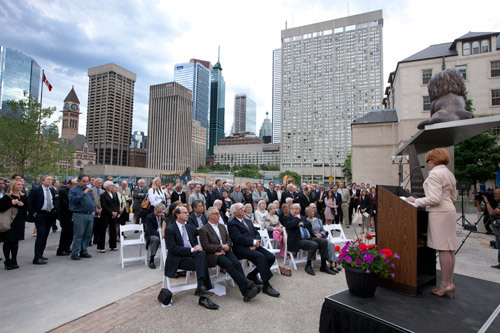 Located in the pedestrian avenue that runs from University Avenue to Nathan Phillips Square between Osgoode Hall and the Courthouse at 361 University Avenue in Toronto, the sculpture garden and education centre recognize the decades of exemplary public service to the people of Ontario and Canada by the Honourable R. Roy McMurtry, while enhancing the judicial precinct. The Gardens presents as an ideal tribute to a man who has made an enormous contribution to our community and our country. “As a long serving public servant, elected official, jurist and diplomat, the Honourable Roy McMurtry has been widely recognized for his compassion, inspiration and dedication to the development of a fair, just and enlightened society,” said Justice Gloria Epstein, co-founder and initial inspiration behind the Gardens. As a tribute to Roy and to the Charter of Rights and Freedoms, the Gardens, as it comes to full symbolic bloom, will communicate to the public, through artistic expression, the values that form the foundation of our system of justice. About McMurtry Gardens of Justice Inc.
McMurtry Gardens of Justice Inc. (MGJI) is a registered, charitable organization formed to advance the concept of, raise money for, and co-ordinate the implementation of The McMurtry Gardens of Justice (the Gardens). MGJI has raised and will continue to raise money to pay for the works of art it establishes in the Gardens. Except for a small amount to cover disbursements, MGJI has no overhead. It operates on a completely volunteer basis.